The owners of Lincoln Kitchen & Tap and B Twenty Four coffeehouse just added another restaurant to Lincoln Heights on March 28. 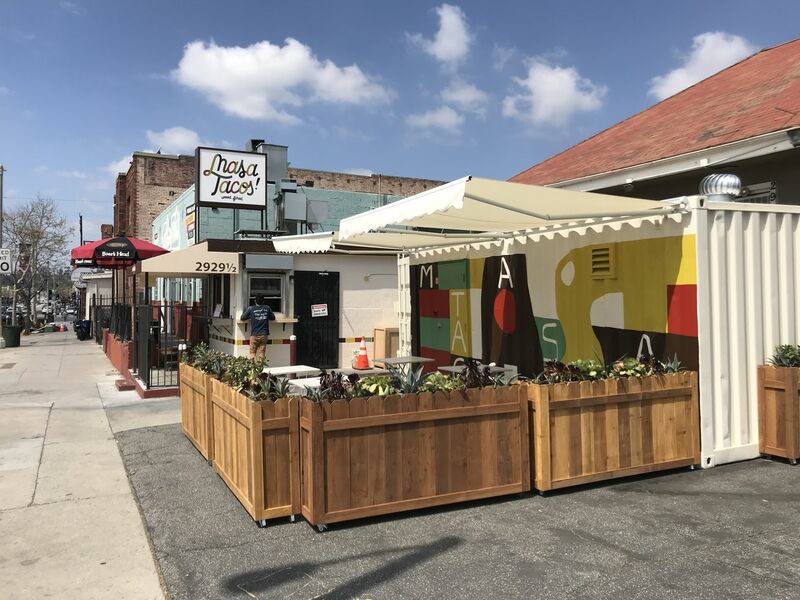 The new tacos and guisados spot is Masa Tacos, which lives right next door to its other popular business, The Heights Deli & Bottle Shop. Masa Tacos makes comfort Mexican by way of handmade flour tortillas. There’s a choice of tacos, quesadillas, or the slightly larger taco, perrones. Masa Tacos’ asada, adobada/pork, chicken, and nopales/cactus are all prepared on a wood-fired grill. Guisados also made their way on the menu, which are braised for four hours and placed on a large flour tortilla with toppings. Aguas frescas, horchata, and Mexican sodas are also on hand. But customers can run next door to The Heights and grab a beer and return to the succulent-surrounded and covered patio that seats 24. Or simply sit at the counter and order from a very reasonably-priced menu. Items run from $2.50 to $4.75. Between The Heights, Lincoln Kitchen & Tap, and B Twenty Four, co-owner Vanessa Baek is creating a presence on Broadway east of the 5 Freeway. All businesses are less than a half mile from one another. Baek took over the shuttered Tacos Chapalita, and brought on chef Moises Gomez as a partner. Both live in Lincoln Heights. Masa Tacos hours are 11 a.m. to 9 p.m. every day.